I don’t cook Indian often at home, but it’s not for lack of love of the cuisine, and especially, its fragrant spices. I reviewed Ragavan Iyer’s tome while at The Sun and just met this Indian chef extraordinaire at the recent IACP conference in Portland. But lately I’ve been most fascinated by the fusion recipes of Monica Bhide, who regularly writes for The Post‘s food section and NPR’s Kitchen Window. And her newish Modern Spice cookbook is a gem. Mark Bittman wrote the introduction. Because morels are the most tempting wild mushroom now in season, Bhide’s Morel Pulao with Cashews grabbed me. I’ve made it twice now, both times without the exact ingredients on hand. I substituted sauteed chanterelle duxelles for the morels the first time and used fresh ones this second time. Didn’t have paneer on hand to use either time, and I had trouble “stuffing” the morels without causing them to crumble. Still, this aromatic, flexible basmati rice dish makes an excellent side or even main dish with a salad. Sauteeing the cardamom, cinnamon stick, bay leaves, grated onion and ground cashews together creates quite a comforting perfume. This is delicate Indian comfort food. The recipe is also less complicated than it sounds. Maybe next I’ll tackle South Indian masala dosas, with their fermented crepe batter. But for now, a rice pulao is a nice place to start. Click below for the recipe. 1. Soak the morels in hot water until soft, about 30 minutes. Soak the cashews separately in hot water for 30 minutes as well. 2. Drain both and set aside. (You can save the mushroom stock for another use, or even use in place of some of the chicken stock). 3. In a blender (or mini-food processor), grind the cashews to a paste; you can add up to 2 tablespoons water to help with the grinding process. Set aside. 4. Wash the morels in fresh water until no grit remains in them. Dry them well. 5. Mix the cheese, mint and 1/8 teaspoon of salt. Stuff into the morels. The stuffing should fill the mushroom but not fall out. Set aside. 6. In a deep saucepan, heat the vegetable oil over medium heat. Add the cardamom pod, bay leaf, cinnamon stick and the onion. 7. Cook, stirring constantly, over medium-high heat until the onion begins to brown. This will take about 7 minutes. 8. Reduce the heat to medium. Add the cashew paste and cook for another 2 minutes, until the paste begins to change color. Add 1/2 teaspoon salt, the chile flakes, and the saffron and mix well. Add 1 cup of the chicken stock and bring to a boil. Add the morels. Cover and cook over medium-low heat for 10 minutes. 9. Add the rice and the remaining 1 3/4 cups of the stock. Bring to a boil. 10. Reduce the heat to low and cover. Cook for 15 to 20 minutes, until the rice is completely cooked and the moisture is all absorbed. If the rice seems moist at this point, increase the heat to medium-high and cook, stirring constantly, for a minute or so. The rice will remain just a bit moist but should not be clumpy at all. 11. Remove the cover and fluff with a fork. 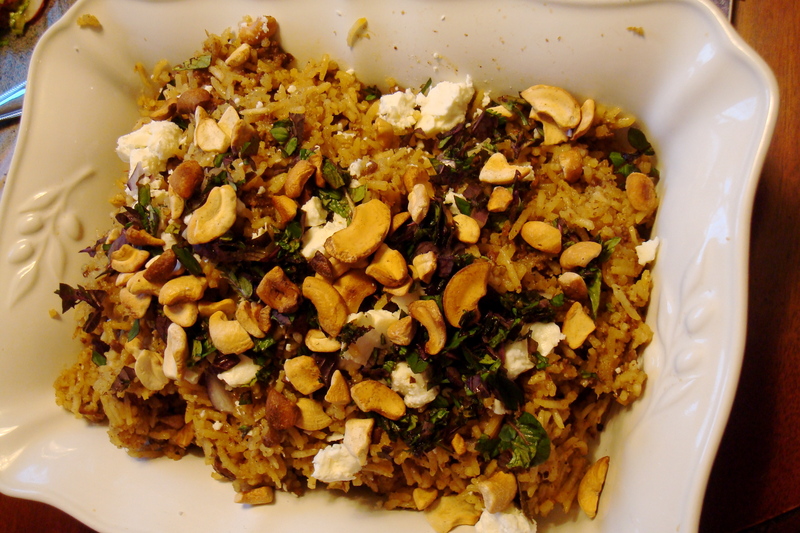 Serve garnished with fresh mint leaves and cashews. I love cookiing Pulav. It’s easy and delicious. The color and aroma from the rice is extraordinery. This recipe is different from what I used to make my pulav, but I like it. Thanks for sharing. What is the country of origin of your pulav recipe? Could you post it? I love how these aromatic refried rice dishes show up in so many cultures, as pilaf, pulao, pulav, etc. This is one of the most unusual recipes i have seen using morels. Will definitely have to try this one. Thanks for sharing.